Tibetan-English verbatim translation, English gloss, and sound clip of the page read in Ladakhi Tibetan. To enter now, select MP3 Version ..or. RealAudio Version ..or. WAV Version. view and print the entire sutra in PDF format, entire sutra as a jpeg, or learn the Tibetan alphabet. 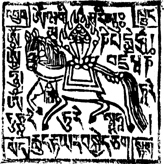 The Tibetan script is the standard version, and compares with copies I have seen from most sources. I would appreciate reports of any typos. To see a diagram of the Tibetan alphabet, click here. 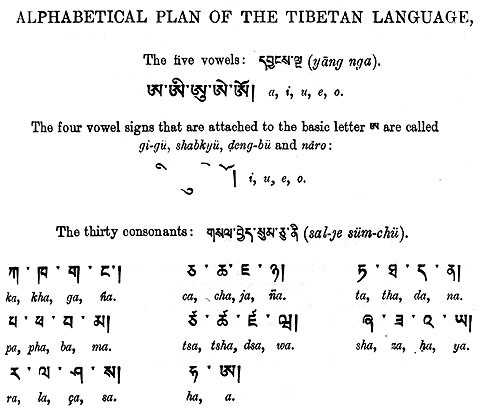 The Tibetan Phonetics, which appear above each line of Tibetan script, are a simplification of Lhasa standard Tibetan. Standard pronunciation is much degenerated from what it was when the spelling was fixed many centuries ago, and many letters are now silent or merely alter the sound of other letters. However, the Ladakhi pronunciation in the sound clips here is closer to the spelling and, presumably, closer to the "original" pronunciation. The Tibetan-English verbatim "translation," which appears below each line of Tibetan, is the main thing of interest, but it's not a true translation. It is very literal, and intended to reveal the root meaning (etymology) of the words--words chosen with obvious care. In some important places there are big differences from most English translations I have seen, most notably the crucial passage in which Chenrezig is asked how a man should be "taught," but answers instead "thus shall he see" and immediately makes the core statement of Buddhist metaphysics: Form is void. To me this implies that wisdom can't be taught, but seeing is believing. This "translation" is cribbed word by word from Tibetan-English Dictionary by Chandra Das, Rinsen Book Company, Kyoto, 1981 (reprinted from the First Edition, Calcutta, 1902) Title Pages I have added as little interpretation as possible. Many words are standard "technical terms," the Tibetan words being intended as equivalents of Sanskrit terms, and require explanation--for example "form" and "void." Other people have done this better than I ever could. 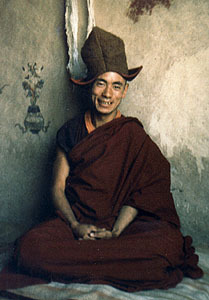 The Sound clips were read by Thubsten Gelek (pictured) at Ridzong Monastery, Ladakh, in July 1982, and recorded by me. There was only one "take." His pronunciation is Ladakhi/Western Tibetan. In the western regions, pronunciation follows spelling much more closely than in central Tibet. The further you go west, the fewer silent letters there are. In language no less than in art and philosophy, Ladakh preserves an older heritage than even Tibet itself. March 2009: Added 1-page PDF of Tibetan text, for printing. December 2005: Added MP3 version. Edited Introduction. Added title pages of Chandra Das dictionary. May 2000: Fixed several typos in Tibetan. Thanks for the reports! July 99: Redesign of all pages (much better, at least on my system). New pages 14-18 (complete). New Tibetan Alphabet chart. Thanks to Edward Conze; to Geshe Tsultrim Gyaltsen for teaching me Tibetan and recommending this text to me; to Thubsten Gelek for reading it for me and being such a good host and friend; and to Rohn Parsons who made sure I continued the study we had each begun when we met at the Burmese Vihar in Bodhgaya--ding!. Thug je che! Best viewed at monitor resolution 600x800, Text size = 0.